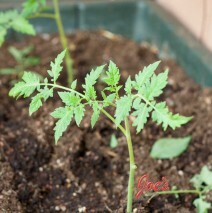 Every Year Dave Fresquez from Monte Vista Organics gives us a few tomato plants. They are planted on the patio at Joe’s and show us when Margherita season starts. That is when soil-grown, sun-ripened Heirloom Tomatoes whose color spectrum reaches from deep purple , bright yellow, green striped to ruby red and sizes ranging from pea to small melon are ready to be harvested . You will see these greens in Salads, mixed Vegetables du Jour, in Quiches, as side dishes, in pastas and any combinations the kitchen can think of. The flavor and texture profile of the different leaves adds variety and excitement to our daily offerings that can only comes from freshly harvested produce. And lets not forget it’s very nutritious too.